← Upcoming panel discussion – End of the mining boom: What’s next? 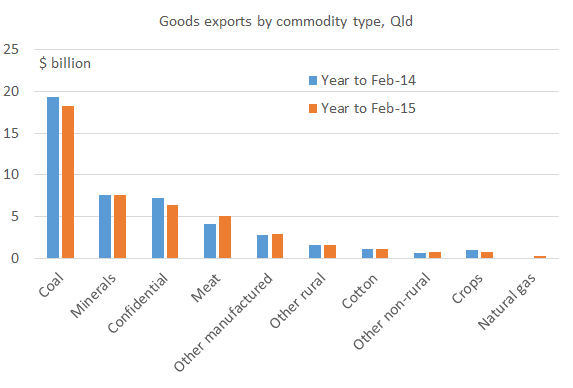 Lower coal prices have translated into a decline in the value of Queensland’s coal exports (by 5.5% in the year to February 2015), contributing to a 1.6% decline in the value of Queensland’s total commodity exports over the same period (see chart below based on Qld Treasury’s latest information brief on goods exports). It’s obvious from charts such as the one below that coal mining is very important to Queensland’s economy. With concerns over pollution in China and climate change, our economy’s significant reliance on coal mining is a substantial risk. The Queensland Government needs to think deeply about our education policy settings to ensure we have a highly skilled and productive workforce that can readily adapt to possible future changes in the structure of our economy. This entry was posted in Mining and tagged coal, exports, mining, qld, qldtreasury, queensland. Bookmark the permalink. Your graph clearly shows how important coal exports are to the Qld economy. There is certainly a lot of work to be done to replace coal as an important export commodity. But replace it we must. Just because it is important to our economy does not make fossil fuel mining right. We all know coal mining is very wrong for the longterm Qld economy. The coal should stay in the ground, until scientists deliver us the technology to extract the energy from the carbon bond, without the need to burn the coal. Future generations will not thank us for extracting, and simply burning this valuable resource. Even if government thinks there is no other option for the economy but to continue our reliance on coal exports – it is certainly a high risk strategy to have such a lack of diversification in our export commodities. Talk about having all your eggs in one basket. Certainly an over reliance on one commodity, and lack of diversification into other sectors, is not healthy for a first world economy. Thanks for the comment, Katrina. I wouldn’t want the Govt to deliberately promote a shift of resources to other sectors, but it would be prudent to prepare for structural change that could occur in the economy by improving our education and training system. Education and training are of course important services exports, not captured in the chart above, and which offer the potential for further export earnings. An interesting post. Thanks. But I find the Treasury brief that you have sighted to be less than helpful (bordering on misleading about what is actually happening in export markets). It reports only the numbers from the ABS, but shows no insight at all. What explains the changes?. The usefulness of these briefs could be increased significantly if Treasury put in a tiny bit more thought and effort. The value of the coal exports might be declining, but the volumes are up. It is the volumes that keep the existing mines operating (providing prices > production costs). So the real consequences of this data are really: 1) The decline in the coal price is slowing / halting investments in new mines; and 2) Less royalties in the Treasury coffers as royalties are a % of the value of exports. The only other major export commodity to show any material change is beef, where prices have risen. I know the Treasury officers involved in developing these briefs are under time pressure to get them out quickly, but I don’t think it is a big ask to get them to add a bit of value to the data.